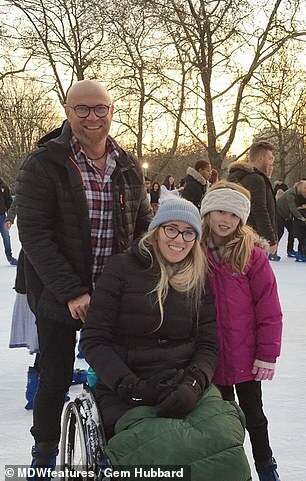 A woman was left wheelchair bound for life after choking on a breathing tube during heart surgery caused her to suffer a severe spinal cord injury. 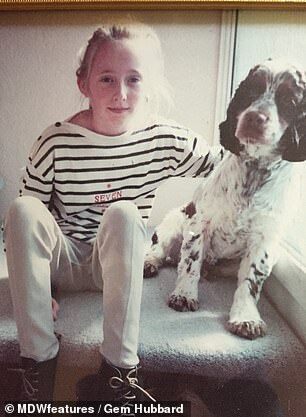 Gem Hubbard, now 34, of Brighton, went under the knife at just nine years old to repair an aortic arch obstruction – when the major blood vessel that carries oxygen to the rest of the body tightens. After coming around, Mrs Hubbard choked on her breathing tube, which caused her to suffer internal bleeding and left her without oxygen for nine minutes. Mrs Hubbard’s parents were told she may not make it after doctors were forced to put her in an induced coma for five days. 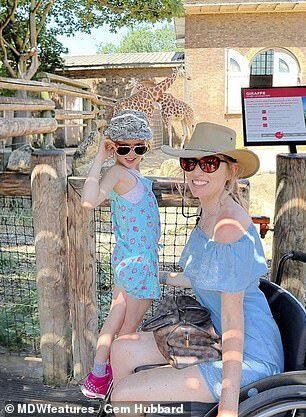 Although she pulled through, Mrs Hubbard – who has a nine-year-old daughter called Daisy Belle – was left with a T10 incomplete spinal cord injury. 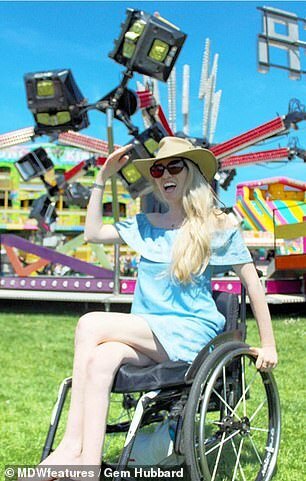 She has been in a wheelchair ever since and is amazed when strangers tell her she is ‘too young’ or ‘too pretty’ to be disabled. 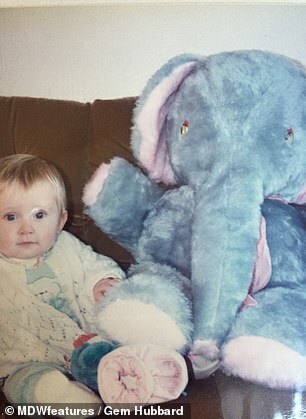 Speaking of her open-heart surgery, Mrs Hubbard said: ‘During the recovery period, my aorta ruptured when I choked and panicked on the intubated breathing tube. Surgeons managed to repair the rupture but the ordeal was far from over. 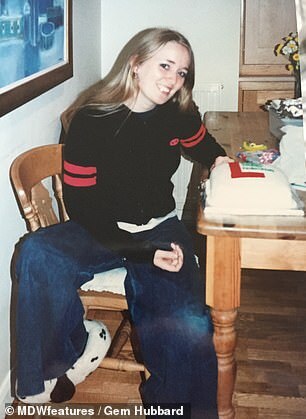 ‘I was put into a medically-induced coma and my parents were told to prepare for the worst, but with my sheer determination I pulled through,’ Mrs Hubbard said. Oxygen starvation is well-known to cause brain damage but it can also affect the nerves in the spine, leading to problems with sensation and muscle movement. The Christopher & Dana Reeve Foundation, which campaigns for improved care after spinal cord injury, says on its website: ‘Spinal cord injury (SCI) involves damage to the nerves within the bony protection of the spinal canal. As she struggled to adapt to life in a wheelchair, Mrs Hubbard’s passion for horses kept her going. ‘I had an incredibly hard time growing up with a disability and I felt very alone and isolated,’ she said. 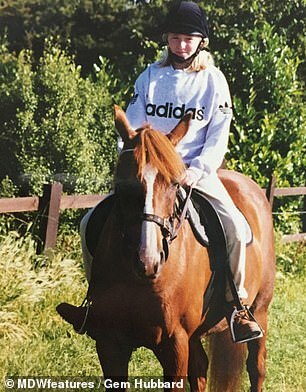 ‘I struggled to fit in socially, however, I was able to keep one passion going, and that was horse riding. ‘I rode at the Riding for Disabled Centre for years and continue to enjoy riding. ‘It wasn’t until I left school and started college that I began to fit in and make friends, and truly enjoy life again. She also met her now-husband Shaun Hubbard in 2004 while at college, who helps her stay positive. ‘Shaun is amazing and if I can’t get somewhere accessible, he will carry me and my chair,’ Mrs Hubbard said. Although she works hard to stay positive, Mrs Hubbard still gets frustrated at how difficult it is to get about in a wheelchair. 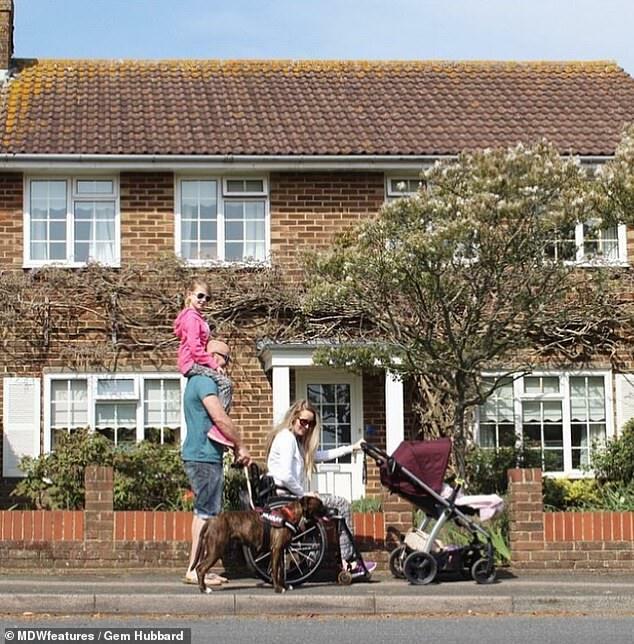 ‘Living in a world that’s not properly designed for wheelchairs is difficult,’ she said. ‘It’s getting better, but there is a long way to go. ‘Only recently I applied for a part-time reception job and everything would have been perfect for me. Mrs Hubbard also struggles to raise her daughter while confined to her wheelchair. ‘I suffer with chronic pain, and that can put a huge strain on my family and social life,’ she said. ‘If I take my daughter to the park, I wouldn’t be able to do household chores on the same day, as it would end up being too painful for me. WHAT IS A T10 INCOMPLETE SPINAL CORD INJURY? The T10 vertebrae forms the base of the section of the spine in the chest area. Known as the thoracic spine, it is made up of 12 segments: T1-12. Patients with injuries to segments T9-to-T12 may experience good upper body control but a lack of function in the legs or torso. They may also have no bladder or bowel control, and a reduced ability to control their midriff. Many patients have good balance while sitting and can stand with special frames or braces. Most T9-12 injuries occur due to osteoporosis, car accidents, birth defects, tumours, infections or compression fractures. An incomplete injury suggests the spinal cord was not severed. Treatment aims to retain function in the non-affected areas. Anti-inflammatory drugs can relieve nerve damage. Surgery may be carried out to relieve pressure on the spinal cord. And therapy help to strengthen the back. Mrs Hubbard also feels judged by strangers, who talk to her as if she was a child. ‘I’m frequently stereotyped for being in a wheelchair,’ she said. ‘People assume I’m mentally incapable and talk to me like I’m a child. 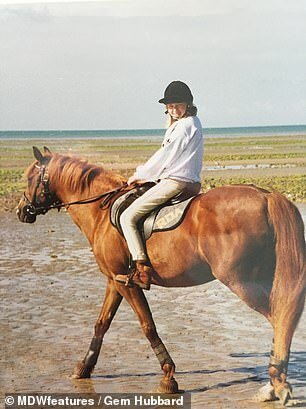 ‘The most laughable comment was when I phoned up to join a new disabled riding school, and the woman on the phone said, “you know it’s riding for disabled?” to which I replied that I knew that, and she said “it’s just you don’t sound disabled”. ‘I also get told that I’m “too young” to be disabled, even though disability doesn’t discriminate against age. Mrs Hubbard often also has people asking her how she ended up in a wheelchair. ‘I hate it when random strangers, who I’m never going to see again, ask me what happened – it’s so rude and invasive,’ she said. ‘A lot of people who have an SCI have a shocking story to tell from road traffic accidents, failed suicide attempts, to being shot. 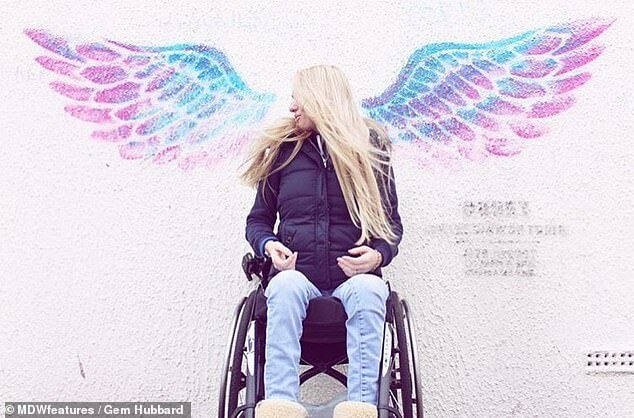 Mrs Hubbard – who has 64,500 Instagram followers – recently launched her YouTube channel Wheels No Heels to connect with other wheelchair users and inspire them to meet their goals. ‘When I was a teen, I hated that I was disabled and that I was different,’ she said. ‘I would have given anything to have changed it. ‘However, now I can truly say I am in a positive place. ‘I feel empowered by my disability. ‘I feel it has given me some amazing opportunities that I would never have experienced. Mrs Hubbard is speaking out to encourage other wheelchair users not to be held back by their disability. ‘You can achieve anything you want, as long as you put your mind to it,’ she said. Find out more about Mrs Hubbard at her Instagram page Wheels No Heels.